Family, friends, coworkers—all will equally love this gift basket brimming with classic gourmet food gifts, both sweet and savory. 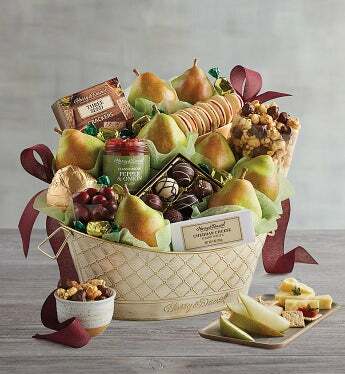 Inside they’ll find handpicked Royal Riviera® Pears, sweet chocolate cherries, milk chocolate Moose Munch® Gourmet Popcorn, sharp white cheddar cheese, and classic pepper and onion relish. Regular includes: 6 Royal Riviera® Pears, approximately 2 lbs. 13 oz. ; Milk chocolate Moose Munch® Gourmet Popcorn, 10 oz. ; White cheddar cheese, 4 oz. ; Three-Seed Crackers, 4 oz. ; Pepper and Onion Relish, 5 oz. ; Chocolate Cherries, 6 oz. ; Signature Truffles (Coffee, Cherry, Raspberry, Almond, All Dark, Double Chocolate), 4 oz. Total Net Weight: 4 lbs. 7 oz. Deluxe includes: 9 Royal Riviera® Pears, approximately 3 lbs. 12 oz. ; Milk chocolate Moose Munch® Gourmet Popcorn, 10 oz. ; White cheddar cheese, 4 oz. ; Three-Seed Crackers, 4 oz. ; Raspberry Galettes, 5.25 oz. ; Pepper and Onion Relish, 10 oz. ; Chocolate Cherries, 6 oz. Signature Truffles (Coffee, Cherry, Raspberry, Almond, All Dark, Double Chocolate), 4 oz. ; Milk Chocolate Mini Mints, 2.43 oz. Total Net Weight: 6 lbs. 9 oz.